Helping clients heal and transform their lives since 1997. I look forward to meeting with you in person. If this is your first time seeing a counselor or psychotherapist, I will help you relax and feel comfortable. It is common to feel a bit anxious, ambivalent, nervous, self-critical, or embarrassed the first time you visit a therapist. Don’t worry, I welcome you to come in with all your feelings, self-doubt, and concerns. Please let me know if this is your first time doing therapy so I can help you ease into the process. I have a cozy, quiet, private office which is warm in the winter and cool in the summer. One room is like an informal living room, with lots of plants. 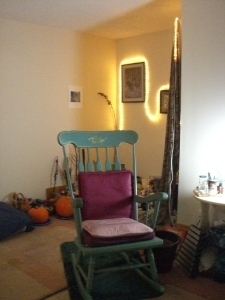 The other room has pillows and softer rugs – it has qualities of a den or an inner sanctuary. My main room with lots of light and plants. A place to relax, breathe, and explore change and growth. My inner room which is softer. A sacred space for deeper exploration. I offer a free initial consultation, so that we can start to know each other, and so that I can learn what problems or difficulties you are experiencing. Together, we will decide if working together is a good fit. It is totally OK if you feel confused, nervous, or shy when you first come in — you can go at your own pace, and say as much as you are comfortable saying at that time. I am a good listener, and I have plenty of kleenex, lots of patience and empathy, and a good sense of humor. I will listen carefully to your concerns, and support your feelings in a respectful way. I will answer your questions to the best of my ability. I may share with you some ideas or insights about what is bothering you, or some goals that we could work toward. I will describe some tools and techniques from among the many approaches that I use to help people feel better. Please call 303-415-3755 or email me so you can start feeling better soon. FAQs – Questions that new clients frequently wonder about. 2. What are sessions like after the initial consultation? I don’t do a one-size-fits-all type of counseling. I will tailor my approach to your individual needs. Although there are some common themes, tools, and techniques that I often use, each session is unique. In our work together, I will draw from a broad set of tools and methods to help you meet your unique needs and goals. We may do talk therapy sometimes, because it can help you see the bigger picture or understand the roots and patterns of certain issues and behaviors. But many of my clients really enjoy and benefit from more active types of therapy, such as dream exploration, Gestalt or EMDR. Enjoy? Yes, it is OK to share laughter as well as tears in therapy. When your feelings start to flow, and you get in touch with your heart and your body, you can experience an aliveness and authenticity that is pleasurable and actually fun. I love to help people change their lives, and I enjoy being part of their team to return to health and wholeness. 3. I feel so stressed out and anxious, I am not able to think clearly or get my work done. Can you help me? Many clients first come in to see a counselor or therapist when they are stressed out. So often I start with some stress management, relaxation, or mindfulness techniques. Relaxation is something you can learn! I can coach you through a sequence of relaxation skills that will help you feel better right away. I also may give you a set of CDs that will help you practice relaxation skills and integrate them into your daily life. Even if you are not very stressed out, almost everyone can benefit from learning to breathe more deeply and more consciously. I teach some very effective body/mind, breath awareness, and mindfulness or meditation techniques to most of my clients. Visit my page on Anxiety LINK XXXX for more information on how you can learn to manage and transform anxiety. 4. How long will it take before I feel better? Everyone has their own rhythm for growth and healing. However, most of my clients have begun to feel better as soon as they learn new ways to come into the present moment, using a set of body/mind practices that I teach in the first or second session. Then they can focus more effectively on long-term goals. Don’t wait to start feeling better. Call me at 303-415-3755 or email me for a free initial consultation. 5. I’m not sure if I need therapy. Isn’t therapy for crazy people? Therapy is useful for anyone suffering from a range of feelings from mild anxiety to depression or severe traumatic stress. In fact, it is much easier to stave off depression by treating it in an early stage, than to climb out of a depression that has become severe. And for couples: Research shows that most couples wait too long before seeking help … about six years too long. It is so much better to be pro-active and learn the emotional and communication skills that can save your relationship before you have hurt each other’s hearts, or let the love die out. Check out Benefits of marriage counseling and couples counseling for information about private sessions and seminars for couples. 6. I don’t want other people to know about what I am saying or feeling. Are the sessions private and confidential? Definitely, all forms of mental health counseling and psychotherapy are held within strict rules of confidentiality. I also protect the privacy of our conversations with a quiet office, thick walls, and a sound screen. There are a few exceptions to confidentiality: 1) The client can choose to sign a “release of information” for the therapist to file insurance, or consult with other health care providers, etc. 2) If a client is at risk of harming him/herself (e.g. clearly suicidal), then the responsibility of a therapist or any health care professional is to act to preserve the life of that individual. This may include arranging for a suicidal client to be hospitalized. 3) There is also a similar duty to warn, if there is an imminent threat to harm someone else. 4) There is a duty to report, by any adult in a position of responsibility, in cases of child abuse. 7. Will I have to take psychological tests? Are there lots of forms to fill out? I am a psychotherapist and Licensed Professional Counselor rather than a psychologist, so I do not offer formal testing. I will do an informal assessment in your first session, and ask about difficulties and symptoms you have been experiencing. Depending on your needs and goals, I will ask for more specific details in later sessions. At your first session, you will fill out a simple intake form, and sign a disclosure form which lists my background and training, and describes basic confidentiality rules in counseling (similar to a HIPPA form that you sign at a doctor’s office). I have a history form that you can fill out at home and bring back. 8. Do you take insurance? How much will therapy cost? If you have health insurance, bring your card, and bring in any information you have about your mental health benefits, as that varies from policy to policy. I am not on any insurance panels or HMOs, but I can help you file for reimbursement as an out-of-network provider if you have a PPO policy. When you call me at 303-415-3755 or email me to schedule your free appointment, please let me know if your want more information about filing out-of-network with your insurance. If you don’t have insurance, we can discuss payment during your free initial consultation. I do take credit and debit cards, as well as checks and cash. I also have a few slots in my schedule that I reserve for sliding scale payments. 9. I have experienced trauma in the past that is affecting me now. I know I need to work on this, but I'm afraid to start. Can you help me? The first thing for you to know is that I have a gentle approach, and that I will start by helping you to feel grounded and safe. I respect your need to go slowly if you need to. When you are ready, I will help you to process the trauma memories with EMDR. This method uses alternating sounds that you hear through earphones or alternating vibrations from pads that you hold in your hands (like 2 cell phones on vibrate). You can control the volume and speed of the sounds or vibrations, and the length of the sets. Call me at 303-415-3755 or email me for a free confidential session to learn how you can start healing from trauma. 10. I am feeling overwhelmed and confused. Can you help me? If you feel overwhelmed or confused, first I will help you to come into the present moment, and to become more grounded and centered. Then we may do some problem solving. I will help you think through your options, or help you form a practical action plan for the next few days. One effective approach is to focus on small, pragmatic, doable steps. If you are chronically overwhelmed, we may need to look at underlying causes as well as strategies. Sometimes overwhelm is simply the result of being sensitive. That is a natural, but there are some techniques that will help you not take in so much from other people’s energy. See my page, LINK XXXX ARE YOU SENSITIVE OR HIGHLY SENSITIVE … coming soon. Sometimes chronic overwhelm is stress from life situations that are well, just simply overwhelming. Again, this may be a completely normal response. But we can look at ways to handle the stress more effectively, change what can be changed in your life, and deal with what can’t be changed by developing inner resources. If you need more assistance than I can provide, I will help you connect with other resources. Please call me at 303-415-3755, as that is quicker than emailing to reach me. If you are feeling suicidal, continue reading #11 below for more resources. 11. CRISIS. I am in a crisis, and I don’t know if I can cope any longer. I feel desperate and I’m scared that I may hurt myself or someone else. What can I do? Because I am not available 24/7, you should call your local mental health center or emergency number. Locally, dial 911 or call Mental Health Partners (formerly the Mental Health Center of Boulder and Broomfield Counties) at 303-447-1665 (available 24/7). If you are a current client, the mental health center or hospital can contact me if you give them permission. We can then work out a plan to help you stay safe after the crisis. If you have been impacted by sexual assault and you need someone to talk to, in Boulder you can call MESA’s 24-hour hotline at 303-443-7300. 12. What is the difference between a psychotherapist, a counselor, a social worker, a psychologist, and a psychiatrist? How do I know which one to go to? Any of the mental health professionals mentioned above can do psychotherapy. The differences are mostly in the degrees that we hold, and the focus of individuals’ practices. There is also a difference between counseling (which includes more guidance and recommendations about problems) and psychotherapy (which includes more focus on deeper issues and psychological processes). I do both counseling and psychotherapy. 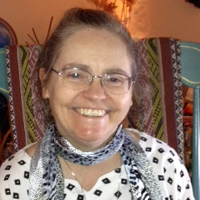 I am a Licensed Professional Counselor (LPC) with a Masters degree in Transpersonal Counseling Psychology. 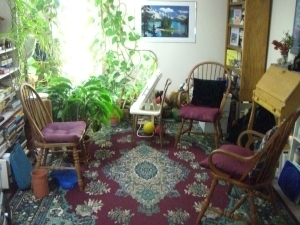 I have trained to work with individuals and couples, and I also have expertise in depth psychotherapy, transpersonal or spiritual counseling, dreamwork, Gestalt, EMDR, and trauma therapy. There are also music and art therapists, and there is a new field of wilderness or eco-therapy. Some counselors focus on family therapy (LMFT = Licensed Marriage & Family Therapist) or do play therapy with children. Other counselors specialize in treating addictions (CAC = Certified Addiction Counselor). Vocational, educational, and rehabilitation counselors do counseling, but not usually deeper psychotherapy. Social workers have at least a bachelors degree to work in agencies, and a masters degree (MSW = Master of Social Work) to do psychotherapy. They are more likely to be involved in the community, and the profession has a history of assisting and advocating for poor and disadvantaged groups. Medical social workers help individuals and families navigate health care needs and services, for example, choices, options, and decisions about putting a loved one in a nursing home. Psychologists have a doctorate, either a PhD or a PsyD. They can do psychological testing as well as psychotherapy. Some psychologists are engaged in research or teaching rather than therapy. A psychiatrist is a medical doctor (MD) who specializes in psychiatry. Psychiatrists can prescribe medications. Most mostly focus on medication management, although some have time to do psychotherapy with patients. MDs who are General Practitioners or Family Physicians can also prescribe medications, but they may not be as up to date on interactions with medications for mental health symptoms. For example, if a doctor gives a patient an anti-depressant medication without asking about bipolar symptoms, he can put the patient at risk for a manic episode. So, especially for complex situations such as bipolar or trauma treatment, psychiatrists are preferred for their expertise in combining medications and monitoring side effects.